Last week I checked out the lowly 2006 Mercedes-Benz S350Â that in addition to being literally short, was short on options too. Today, we travel to the other end of the (non-AMG) W220 spectrum with a car that has no problem with features or power, the S600. The thing about the W220 S600 is that despite only being produced from 2001 to 2006, this super sedan had two variants of V12s. The early S600s used the naturally aspirated 5.8 liter M137 that was so disastrous that it only lasted two years before the engineers went back to the drawing board to totally redesign a new V12 for their flagship cars. What they came with was a twin-turbo 5.5 liter M275 that proved to be much less troublesome. 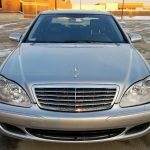 Luckily today’s car, a 2003 S600 for sale outside of Chicago, sports the M275. Even better, it checks in with just a little over 27,000 miles. 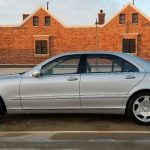 2003 Mercedes-Benz S600 V12 5.5L TURBOCHARGED ENGINE ,1 OWNER luxury vehicle with only 27K.MILES , automatic transmission , power windows and doors , leather interior with heated and cooled seats , heated rear seats , luxury package wood trim , leather dashboard , premium stereo system with navigation , front and rear parking sensors , sunroof , power folding mirrors. There is no mechanical issues or visible body damage or rust. This sport car runs and handles great. All the tires still have plenty of tread on them . Vehicle was checked by the licensed professional shop, no issues was detected . .
BID WITH CONFIDENCE – BUY SMART SAVE BIG!!! Thank you for looking and good luck bidding!!!! PLEASE MAKE YOUR RESEARCH OR ASK US ALL THE QUESTIONS BEFORE MAKING THE PURCHASE !!! DEPOSIT ON THE AMOUNT OF $500 IS NOT REFUNDABLE !!! !!! FREE SHIPPING WITH BUY IT NOW PRICE !!! You are playing with fire with any V12 W220 and need to understand that something can very wrong at any time that could very expensive. 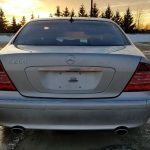 Dreaded ABC suspension issues, $1,200 per bank coil packs, power steering lines (that runs on the same system as the ABC) and not to mention your typical run-of-the-mill things that can go wrong with any W220. With this S600 and it’s mileage, you basically know that at some point you are going to have to deal with these issues. The 27,000 miles is nice because it is basically close to a new car, but you understand you’ll be the one replacing everything once you start racking up the miles. This example isn’t perfect because it is missing the Distronic cruise control option and it looks like the driver’s side headlight is fogged up a little, but it’s hard to be picky with these beasts. Most of them were leased, driven hard and now are on their 7th owner. Finding one this clean isn’t an easy task. For me, $20,000 is a tough pill the sallow. At the price, I’m going all out and finding a clean S65 AMG because you are literally going to be dealing with all the same problems as buying this car. With the S65, you get all the extra power, a newer car and one that in my opinion, looks better too. I guess if you want to fly under the radar than this isn’t a bad choice, but like I said, buyer beware. You might luck out and be problem free for a year in one of these things, but it’s not if something is going to happen, it’s when. Tagged 2003, M275, Mercedes Benz, S class, s600, V12, W220. « Double Take: 2011 Porsche 911 GT3 RS – Black or White?